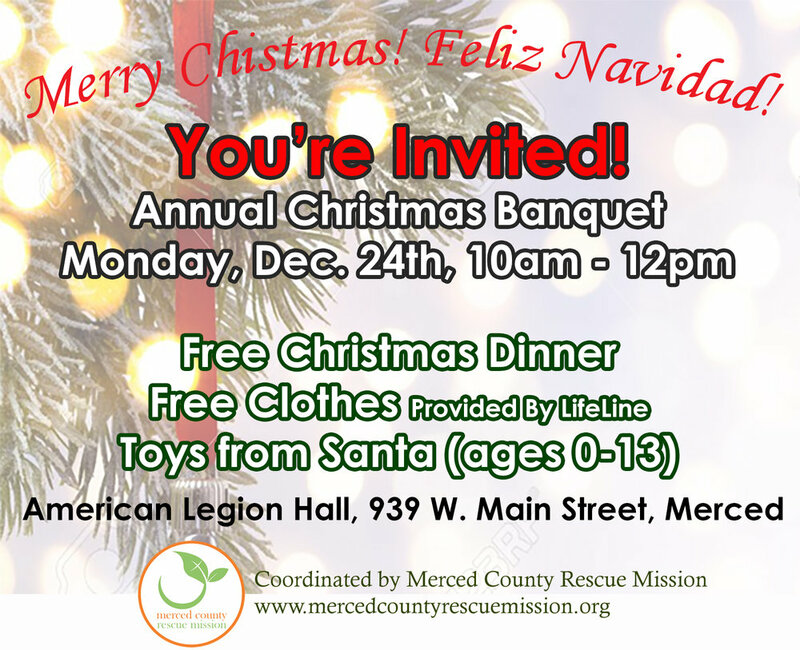 This Christmas Eve, we invite all who would like to join us, to our Annual Christmas Banquet, Monday, Dec. 24th, 10am-12pm at the American Legion Hall, 939 Main St., Merced. Please share, let's get the word out to families and many others who may not have a place to go to enjoy a Christmas dinner! Santa Claus will be there to personally hand out toys to children up to the age of 13 and LifeLine will be there with free clothes for those in need. Those interested in volunteering can contact Tim Adam at 209.947.1394. We could use more toys for this event - If you'd like to donate new, unwrapped toys please bring them to the American Legion Hall at 9am on Monday, 12/24. Thank you! Newer PostChristmas Banquet A Success!